Students for Students, formerly known as Bruin Shelter, is a nonprofit organization located in Los Angeles, CA that provides temporary housing to students who are experiencing homelessness and attend either Santa Monica College (SMC) or the University of California, Los Angeles (UCLA). The shelter accommodates 9 guests between the ages of 18 - 24 and is supported day and night by 60 student-volunteers. Guests are allowed to stay for up to six months, receive case management to assist with securing stable housing, and are served breakfast and dinner each day. 10,000 college students are experiencing homelessness in the state of California, and according to The Free Application for Federal Student Aid (FAFSA) there are at least 58,000 students experiencing homelessness nationwide. As many recent high school graduates prepare to go off to college, many of us may envision them spending their time studying, partying, joining fraternities and sororities, and eating Maruchan Ramen Noodle Soup from the comfort of their dorm rooms. In reality, many college students are grappling with food insecurity and housing instability for a variety of complex reasons. Some experience homelessness throughout their childhood and therefore do not have a permanent home to return to once classes end. Some have aged out of the foster care system. Some have lost their parents to death, deportation, or incarceration. Some have been kicked out of their homes because of their parents' attitudes towards their sexual orientation or religious affiliation. Many of these students will stay at a friend's apartment for a few days bouncing to a different couch once they have exhausted their stay, and some will stay in their cars, abandoned buildings, or homeless shelters. Keeping up with the assigned reading and studying for exams can be stressful within itself but imagine having to constantly worry about finding a place to sleep and comfortably do homework. Community college students are especially vulnerable to becoming homeless. According to a report by the Wisconsin Hope Lab, "half of community college students are struggling with food and/or housing insecurity." A significant amount of these students receive financial aid and are employed but oftentimes this is not enough to alleviate issues of hunger and homelessness, and many feel they have no choice but to dropout which may hinder their chances of escaping cycles of poverty and homelessness. 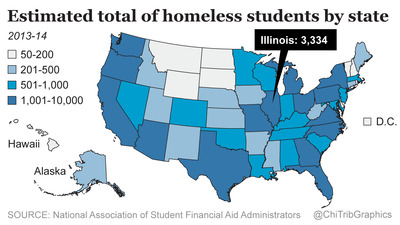 During the 2013 - 2014 school year, there were 3,400 college students experiencing homelessness in Illinois, the third largest behind California and Texas. To help combat these issues many schools offer food pantries to their students; as of June 19, 2017 there are 508 member institutions registered with the College and University Food Bank Alliance. At the University of Illinois at Chicago there is the Pop-Up Pantry, at Northern Illinois University there is the Huskies Student Food Pantry, at the University of Illinois at Urbana there is the Wesley Food Pantry, at Southern Illinois University - Carbondale there is the Saluki Food Pantry, at Northeastern Illinois University there is the NIEU Student Food Pantry, at Elgin Community College there is the Spartan Food Pantry, and at Aurora University there is Libby's Place. Many institutions are also making their dorms available year-round for students experiencing or at-risk of homelessness, and some nonprofit organizations in Illinois are helping students to find housing. In 2014, La Casa Norte piloted their Youth in College Program which provides housing and case management to six full-time college students who are exiting transitional housing. El Rescate, a nonprofit organization in Humboldt Park, provides culturally appropriate, identity-affirming housing for homeless LGBTQ and/or HIV-positive youth ages 18-24. Click here for more resources.